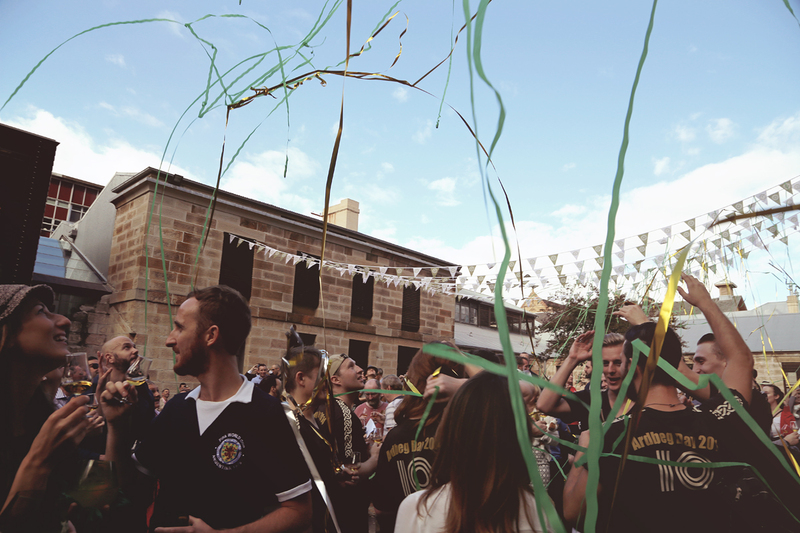 With Ardbeg Day 2015 rolling around in less than a month (May 30th to be exact), I thought it was about time I recapped last year’s festivities in Sydney. Pictures speak a thousand words, so I’ll let them do most of the talking. 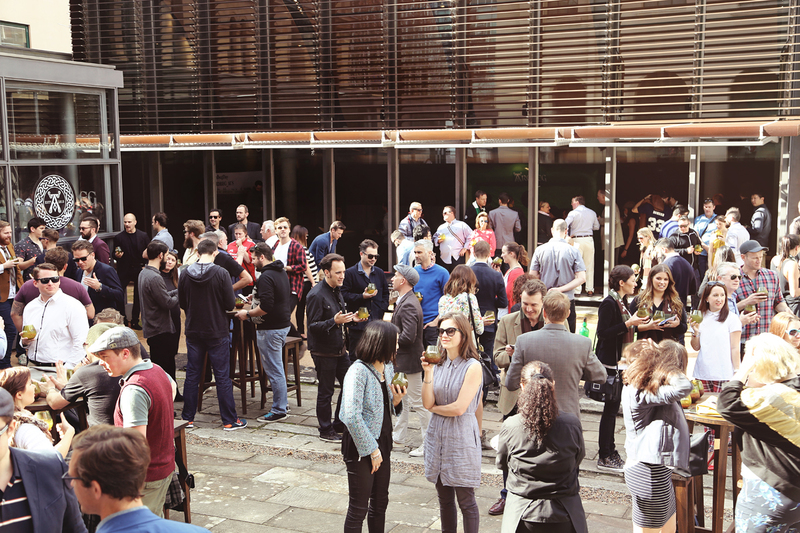 Sydney’s 2014 Ardbeg Day celebrations were held at The Mint, Sydney CBD’s oldest public building that once operated as a coin producing facility. 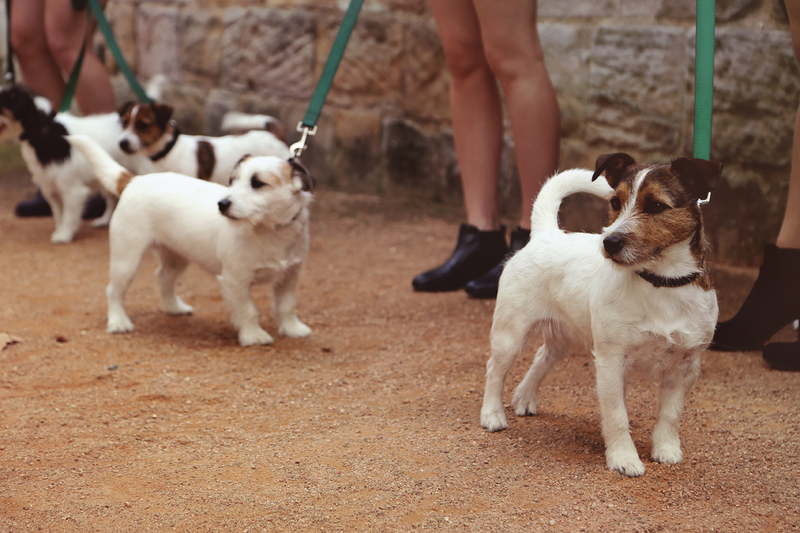 Walking through the 19th century wrought iron gates, we were greeted by Shortie and his relatives. Pretty sure I’m in the right spot. Two steps further inside. Ah yes, I’m most definitely in the right spot. I’m not generally a huge fan of whisky cocktails, but there were two variants on offer and one of them was a cracking, moreish concoction of Ardbeg 10 year old, pear nectar and simple syrup with a dash of vanilla and orange bitters to boot. I’m sure it had an official name, but I’m simply going to call it delicious peaty breakfast juice. 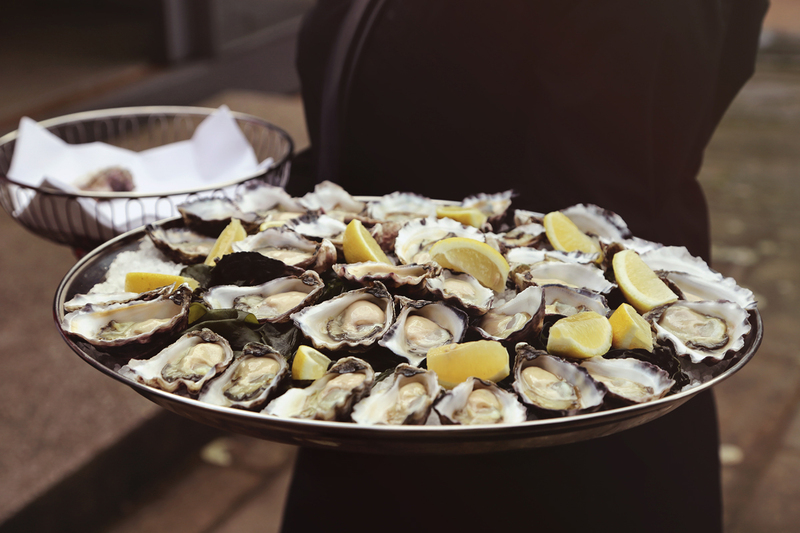 We all know what happens when you drink on an empty stomach but thankfully there was no chance of that happening with ample canapés doing the rounds, including dozens and dozens of freshly shucked oysters. If you’ve not yet samples oysters + a drop of peated whisky, take my word for it, it’s a stellar match. 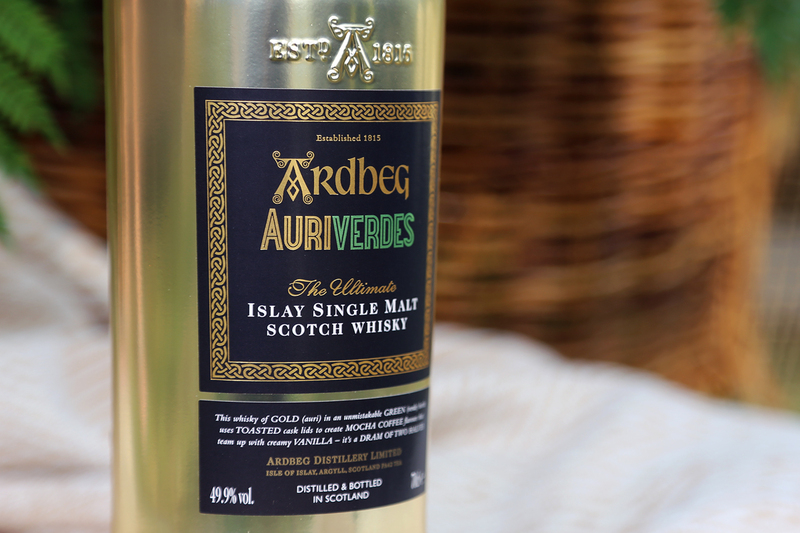 Before the day’s festivities even rolled around, we knew 2014’s Ardbeg Day release was called Auriverdes (meaning gold and green). 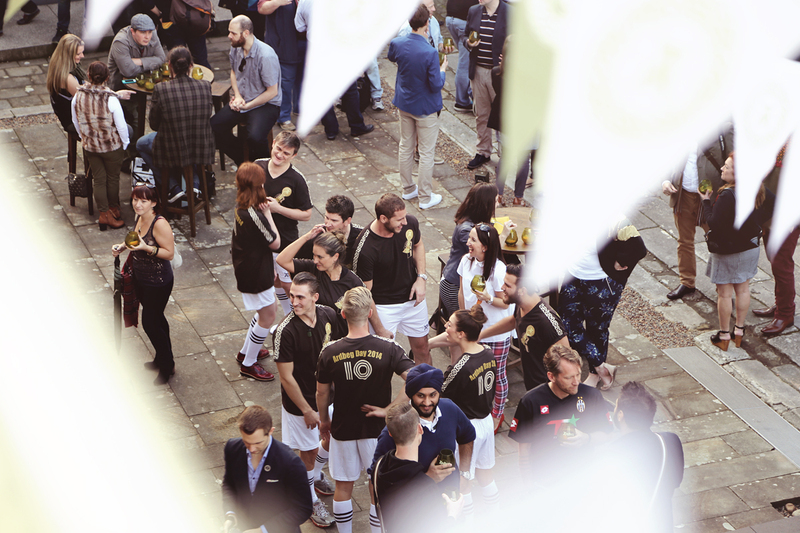 We also knew 2014 happened to be the year the FIFA World Cup was being held in Brazil, so it came as no surprise to find the day heavily soccer themed. 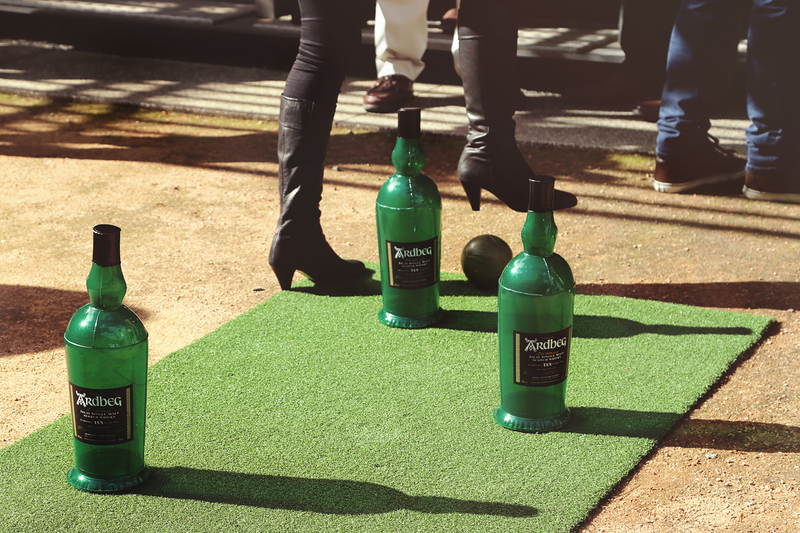 If you could drag yourself away from the Ardbeg, edible delights & live music, there were a bunch of soccer themed games and activities setup. I must admit that I didn’t really pay too much attention until I noticed some mates return with a loot of prizes. Then it was game on! 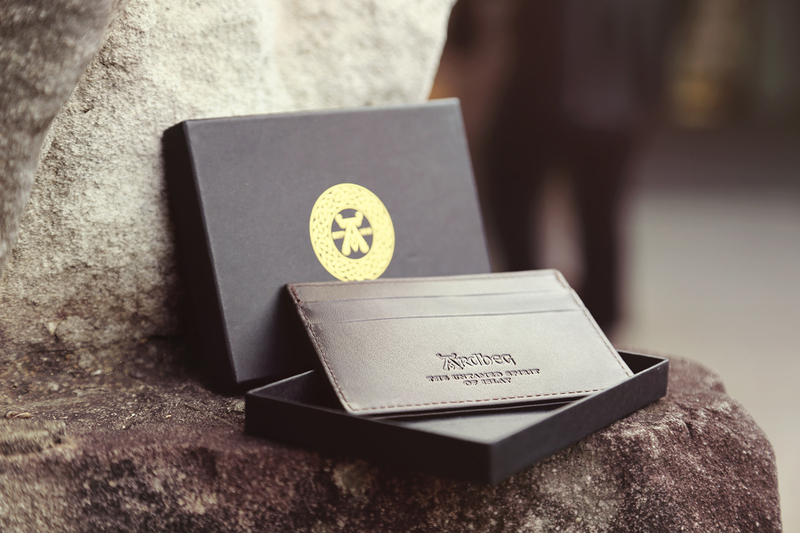 I managed to score some Ardbeg coasters, a fob key ring and this neat cardholder – which is rather astonishing considering I have two left feet and zero sporting ability. If there’s a similar setup this year, mark my words, I plan on being a walking Ardbeg merchandiser by the end of the day. The small Ardbeg-branded foosball table was good fun, but from the moment we first walked in, we all really wanted to see was this one in action. 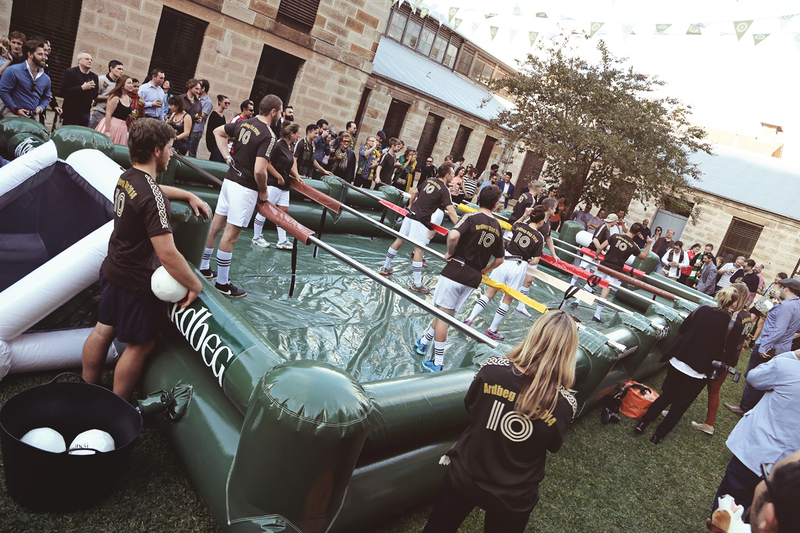 That’s right, a human-sized inflatable foosball table! Yes, we got to have a go at the end. Yes it was loads of fun. Yes, we all thought we were elite athletes when we were strapped in there. Speaking of which, former Socceroo, Chelsea and Man. United goal-keeper, Mark Bosnich, was on hand to award the winners with their trophy and help officially introduce Auriverdes to the crowd. And that’s when things really kicked-off! I don’t think I could ever tire of this sight – enjoyed responsibly, of course. Just in case you needed a top-up at all, there was an extra bottle on hand. All this sport made many rather hungry, so this was a welcome sight to all. 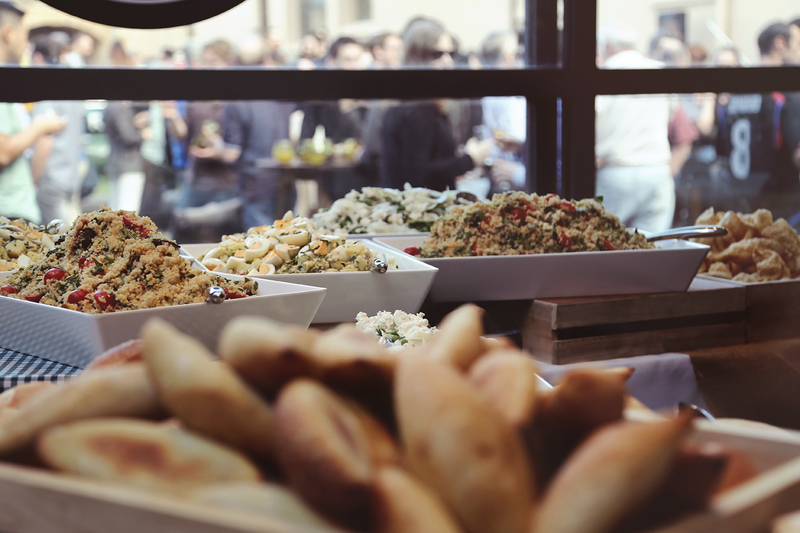 Spit-roast, salads and sides – all generously on the house. 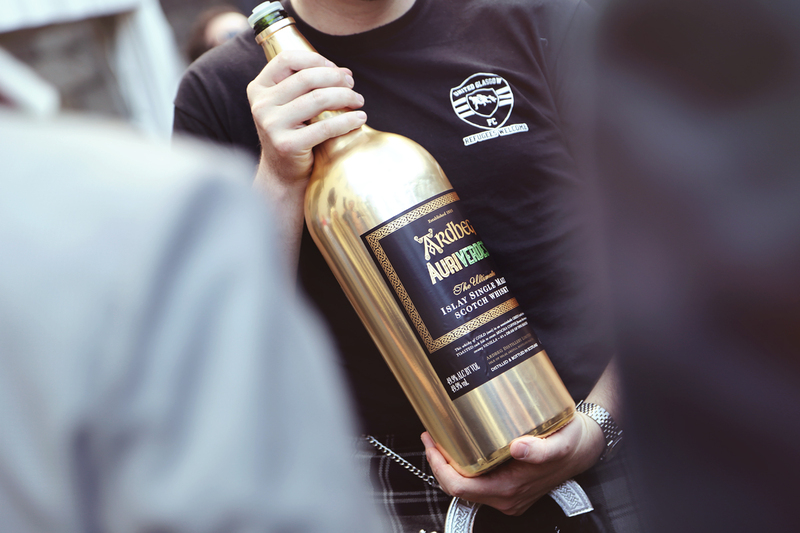 If you liked the look of this, then you really, really don’t want to miss Ardbeg Day 2015! 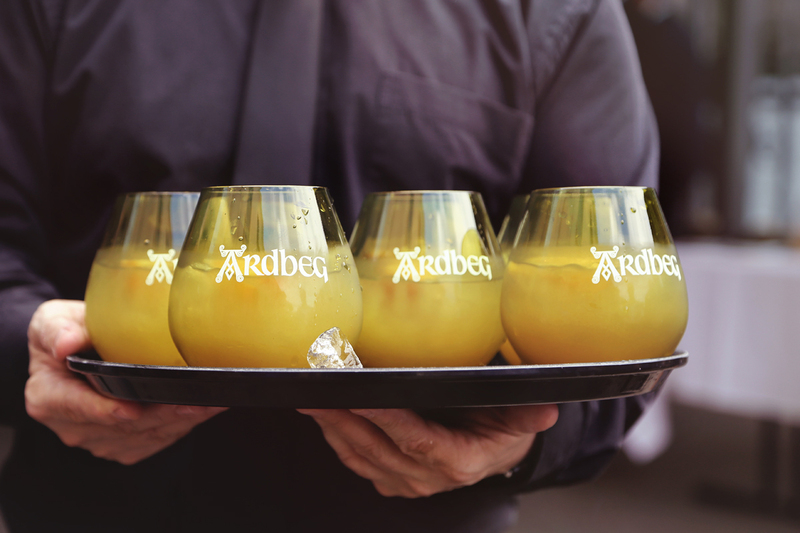 Head on over to Ardbeg.com, register your details, become an Ardbeg Committee Member and be the first to get notified when Ardbeg Day registrations open. See you on the 30th… in the future. One evening, well over a year ago, I was browsing the online catalogue of a major drinks retailer when I spotted a few whiskies in their ‘Clearance’ section. 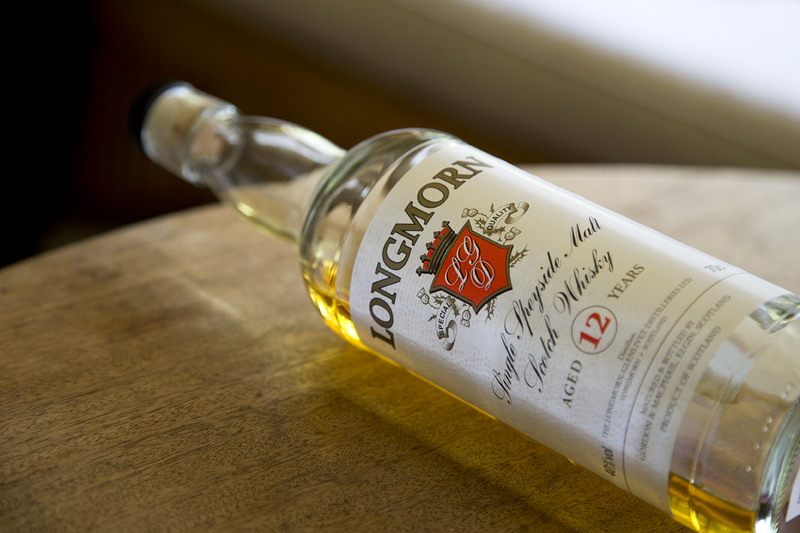 One of them happened to be this 12 year old Longmorn bottled by Gordon & MacPhail, so I picked it up for around the AU$50 mark and thought I’d give it a go. Aside from the official 16 year old (which is the only current official bottling), we don’t really see that many Longmorn expressions in Australia, not even indie bottles. The distillery itself has quite a high capacity (around 3.5 million litres per year) with most of it destined for Pernod Ricard blends, like the Chivas range. With a production capacity of that size, there seems to be plenty of whisky going to the independent bottlers out there and some of them are bottling expressions that are well worth trying! (I’ve tried some fantastic Longmorn in the past). Not an awful lot of information on this one apart from the 12 year age statement and 40% ABV. I’m almost certain it’s been chill-filtered and if I had to guess, I’d say it’s more than likely made up of refill bourbon casks with a smattering of refill sherry casks in there. I’d probably consider this to be somewhat of an entry level malt if you will. On the nose I got all of those classic soft Speyside notes like green pears and apples, freshly cut grass, some light zesty notes and a mild honey sweetness. There’s also a hint of funky cardboard. Very thin on the palate, with some mild baking spices up front, followed up green apples, some barley/cereal maltiness and a hint of marmalade. It finishes quite dry with some oaky spice and powdered ginger, whilst that cardboard note from the nose seems to work its way in there too. Overall I found it very mild and mellow with lots of soft pleasant notes, but also a couple of oddities that unbalanced it slightly. It’s not the most complex dram (but then again, I wasn’t expecting it to be), but it’s still quite an enjoyable, light, summertime whisky. I’d probably consider it as a pleasant alternative to the likes of the Glenmorangie 10 year old, or Glenfiddich/Glenlivet 12 year olds, perhaps a tad less-refined though. 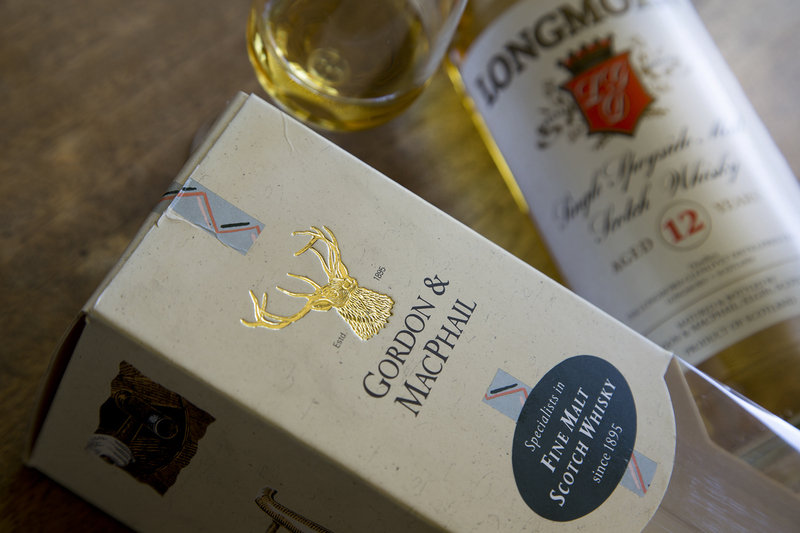 Nice work Gordon & MacPhail, looking forward to trying more from your range in the near future! 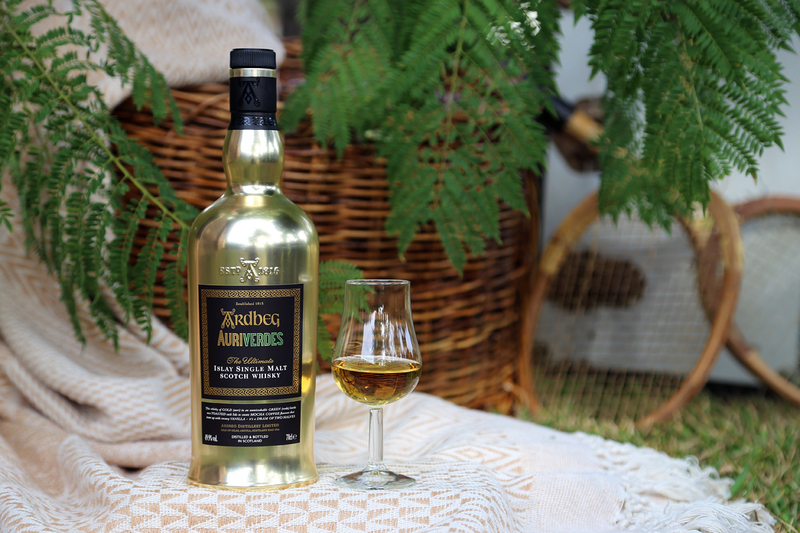 On 31 May 2014, Ardbeg will officially release their third annual Ardbeg Day whisky, Auriverdes – the name being a nod to the golden (auri) Ardbeg whisky and the iconic Ardbeg green (vedre) bottle. 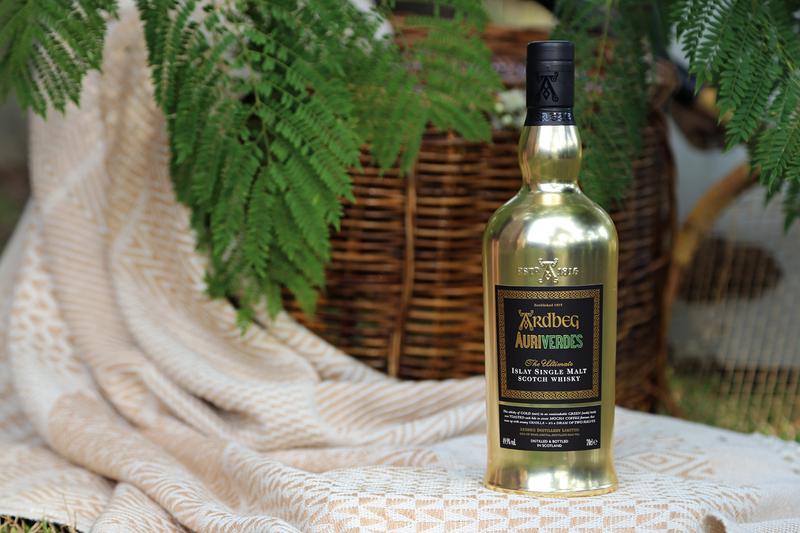 The bottle labeling also points to subtle second meaning in the name, with Auriverdes said to be ‘a winning dram’ with vanilla ‘driving the flavour home’ with this Ardbeg being a ‘kick’. In case you doubted the not-too-subtle World Cup references, then the sight of this stunning trophy – I mean – bottle will surely change your mind! I guess this one can simply be called Auri. Auriverdes is described as being a whisky of two halves, with the official release citing a new toasting technique that gives the whisky ‘a mocha coffee flavour at one end, flowing into creamy vanilla at the other’. I’m thinking this could mean that cask the lids have each been charred to a different level? Until such time as I get an audience with its creator, the talented Dr Bill Lumsden, that’s just going to have to remain a guess. As for the remaining particulars, it’s bottled at 49.9% ABV following an unknown number of years of maturation in American Oak casks. It was a bittersweet moment cracking open this bottle. On one hand, I was opening the most striking, individual looking bottle I’ve ever owned. On the other hand though, I knew it was full of Ardbeg – and no ordinary Ardbeg at that – a new expression that I was fortunate enough to get a sneak preview of, ahead of its official release. With a squeak and a th’dunk, that cork was out and a dram was poured. It’s golden indeed! Shall we give it a taste? Up front, I get some pretty big sweet creamy vanilla notes, milky chocolate and a slight peaty freshness (almost light in a way – not overly medicinal or earthy). After a few minutes I got some grassy hay, a dry herbal character and some hints of lemon and mandarin zest. Quite spicy up front. A nice oiliness gives way to some pretty boisterous, tarry medicinal peat – more than I got from the nose, that’s for sure. Tangy saline emerges, along with a fair pinch of spice, zest and a subtle honey sweetness. Overall, still quite dry and fairly light. A fairly lengthy, warming finish, albeit quite dry and slightly tannic. I got some more vanilla sweetness at first, but that seemed to fade to a good helping of ashy peat and smoked meats, which linger to the end. Overall, I found this to be a lighter style of Ardbeg, taking some of the freshness of Ardbeg Day, but picking up on the subtle rounded notes of Ardbog. In the end though, it’s very different to both and a completely unique expression in its own right. As with the other two, I’m not sure I can liken it to anything else Ardbeg currently offer. I’m so glad Dr Bill and the Ardbeg boffins continue to mix it up and experiment with their stocks, putting their crazy ideas into practice and coming up with some pretty exciting creations. In 31 sleeps, Ardbeg fans the world over are going to be in for a bit of a treat when this gets released. 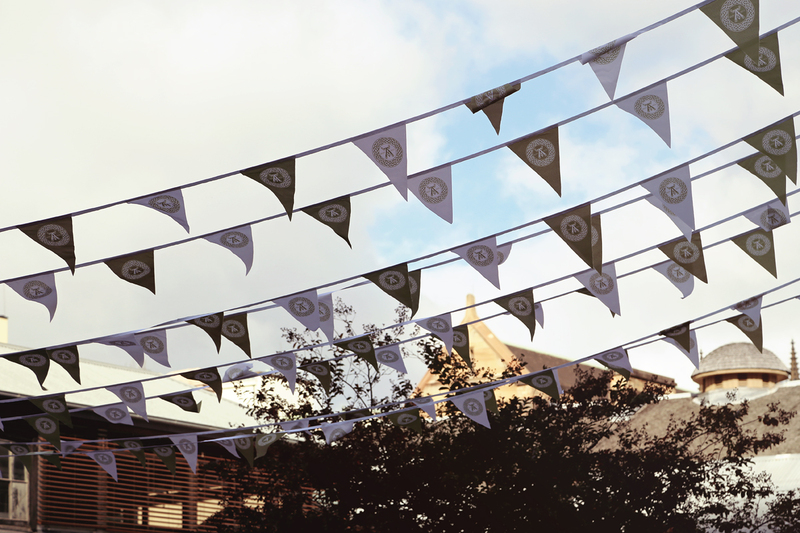 If you haven’t done so yet, sign up to the Ardbeg Committee and come along to Ardbeg Day on 31 May. 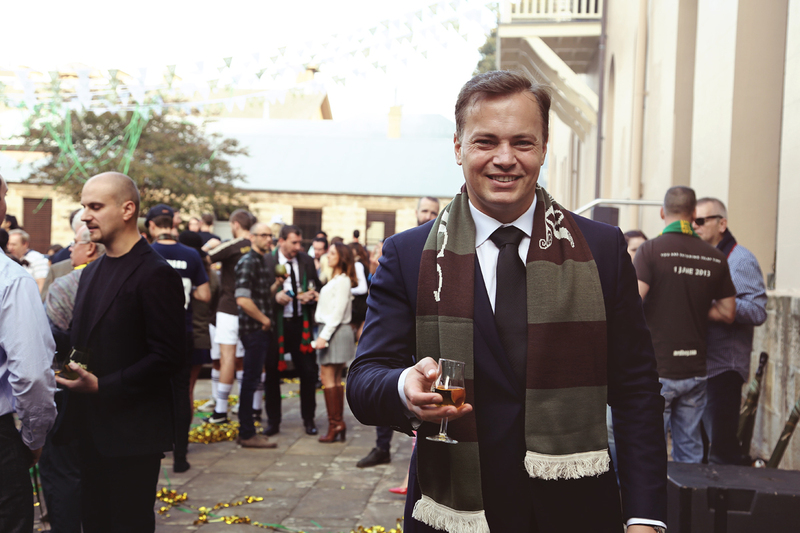 A sincere thanks to Ardbeg Australia for the sneak preview. Bring on Ardbeg Day! 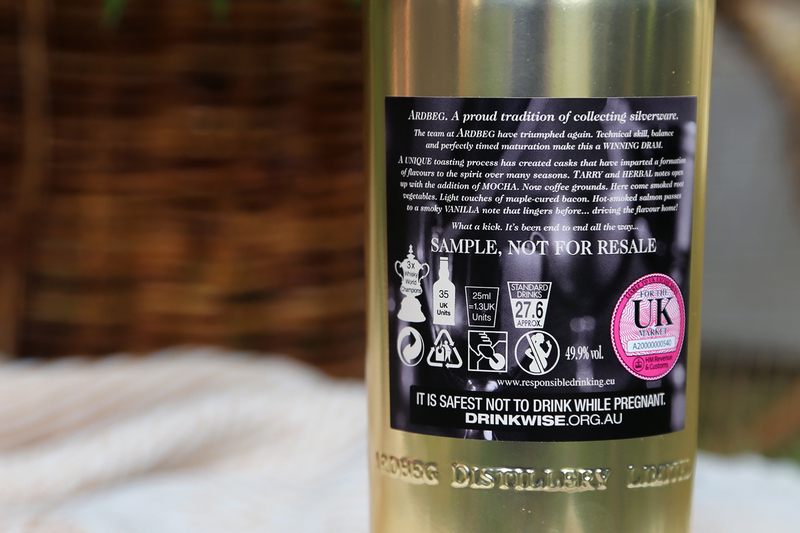 Edit – I’ve since been advised that the RRP in Australia is actually AU $190 and not $135.70 as referenced above. 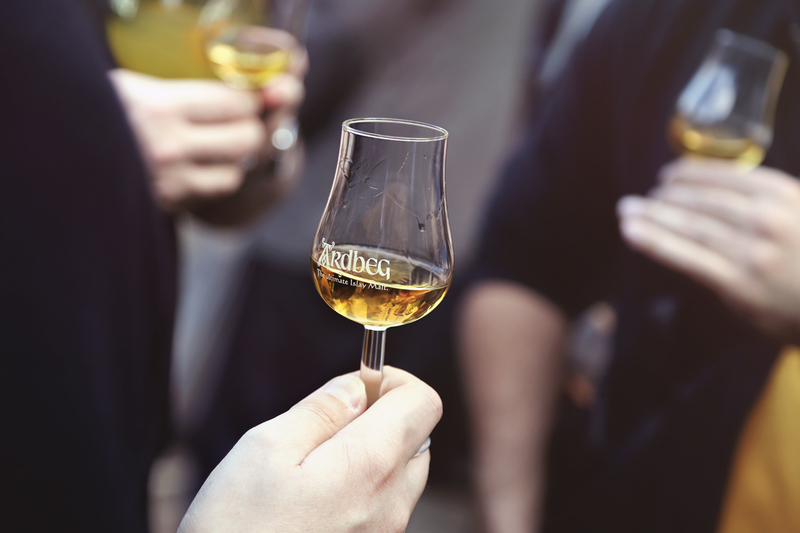 In 2013, Ardbeg decided to (temporarily) rename their global day of celebration to help bring attention to the famed peat bogs of their island home and to celebrate the vital part they play in making Ardbeg the peaty pleasure that so many love. For that reason, Saturday 1 June 2013 was coined Ardbog Day. 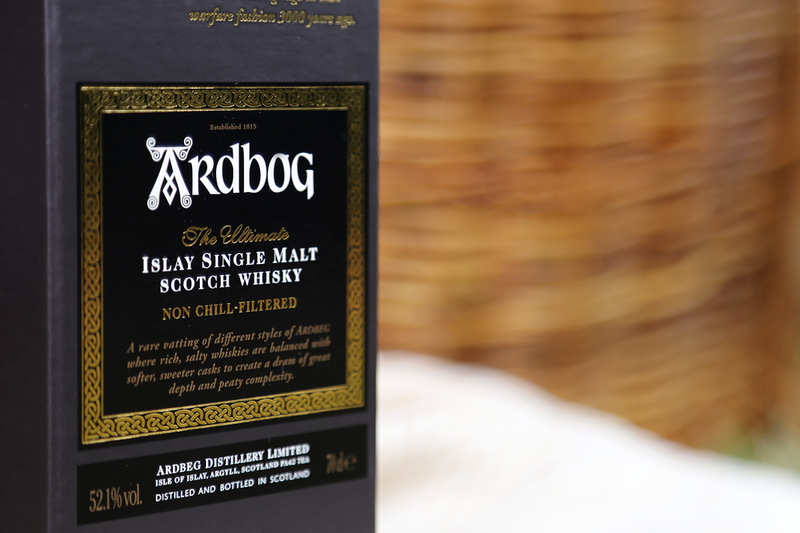 And what should they name their limited release whisky for Ardbog Day? There’s a bit of theme going on here guys! Fans the world over eagerly awaited this release and just like Ardbeg Day the year before it, Ardbog was released globally on Ardbog Day, 1 June 2013. Ardbog had more of a traditional presentation this time, with the hallmark Ardbeg green bottle, dark-coloured label and black presentation box. 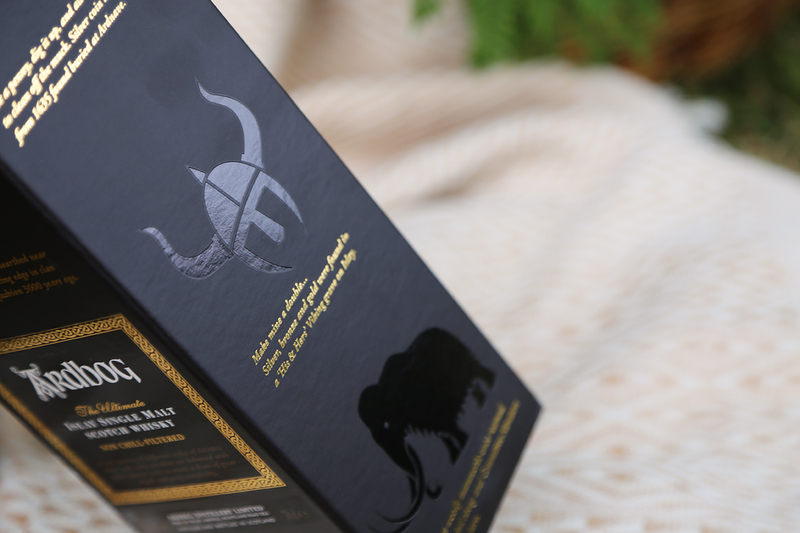 Not one to disappoint when it comes to quirky details, the matte presentation box was covered in gloss illustrations and gold lettering spelling out interesting peat bog tidbits. 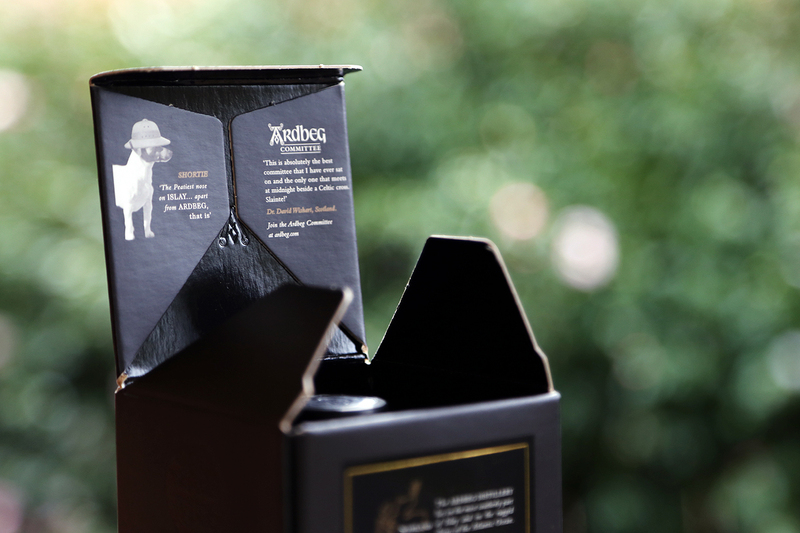 The detail continues on the inside lid, with Ardbeg’s mascot, Shortie, making one of his many appearances throughout the packaging. 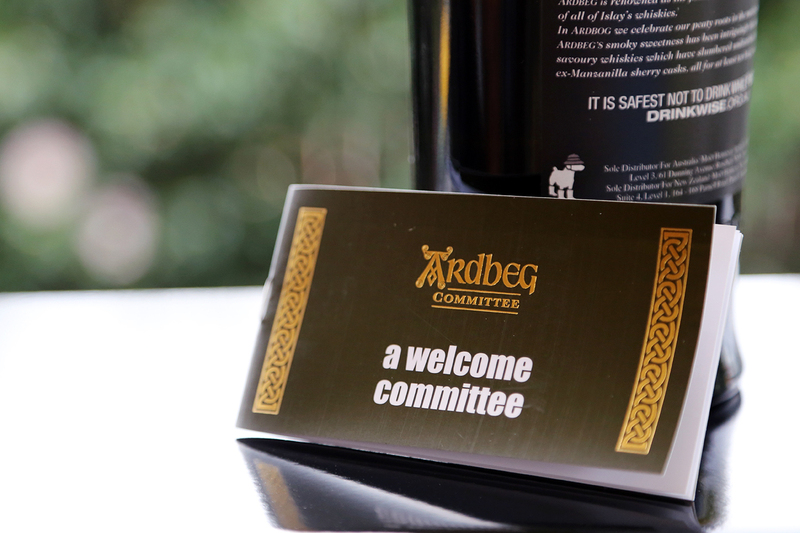 There’s also a handy Ardbeg Committee booklet inside, detailing Ardbeg’s core range and all you need to know about becoming a committee member. And then we get to the whisky itself. 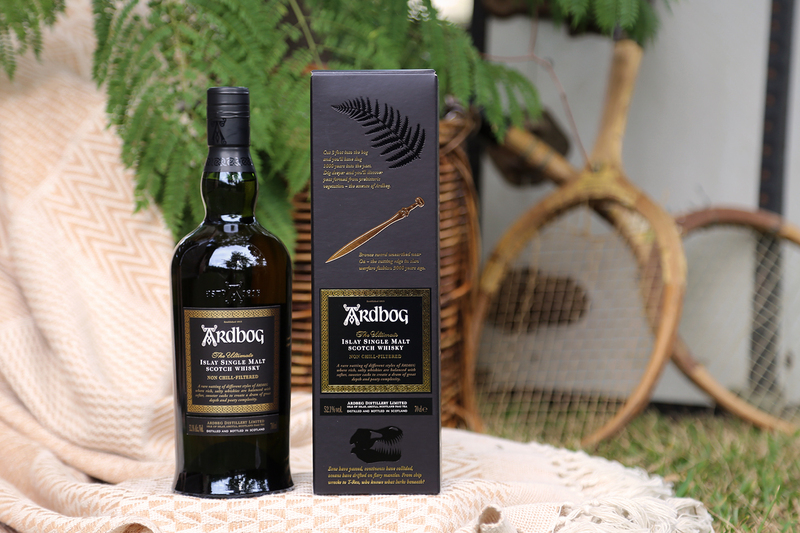 While there’s no age statement as such, Ardbog is a vatting of ten year-old Ardbeg matured in traditional American Oak ex-bourbon barrels and European Oak ex-Manzanilla sherry casks. Finishing generally describes the process of moving the contents of one cask (traditionally an American Oak barrel), into a second cask for a short period of time before bottling. The second cask is often fresher and/or treated with an alternate wine or spirit of some sort (think sherry, port, rum, various other wines etc.) which is done to impart some more flavour and complexity into the whisky before it’s bottled. 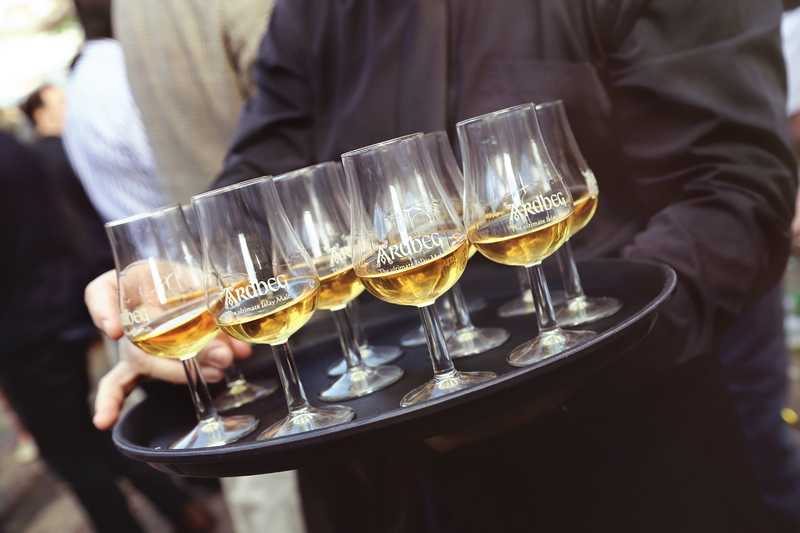 2012’s Ardbeg Day is an example of whisky that was ‘finished’ in ex-sherry casks (for a period of six months) before it was bottled. Vatting on the other hand generally involves taking two or more different casks of whisky and mixing them together in a vat for a period of time, before they’re bottled. 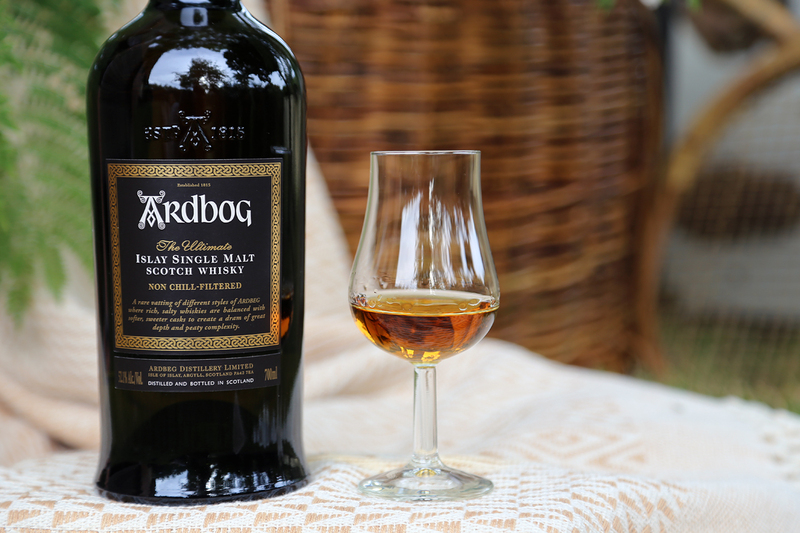 In this case, Ardbog is a vatting of ten year-old Ardbeg matured in American Oak ex-bourbon casks and ten year-old Ardbeg matured in European Oak ex-Manzanilla sherry casks. Quite rich, full and deep. Sherry fruitiness, hints of plum, charred peaches, cinnamon, some bonfire smoke and salty coastal notes. 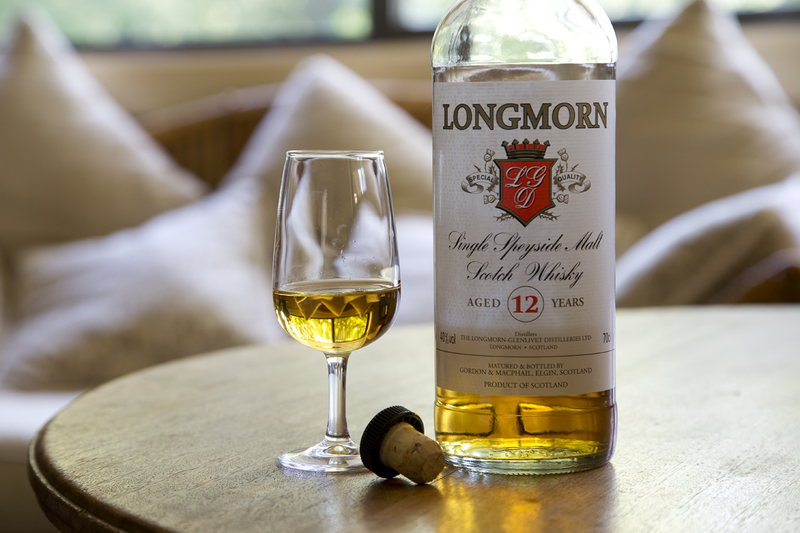 Slightly syrupy in nature and full of rather round, soft aromas – quite refined and balanced. Never thought I’d say this about an Ardbeg, but I almost want to describe the nose as subtle. Medium body mouth feel, not too hot and big on flavour. I got currants, some berries, charred woody smoke flavours, some BBQ smokiness and fragrant peat. A salty saline peat tang hits in the sides of your tongue, but nowhere near as much as many other Ardbegs – sherry sweet and salty savoury at the same time. 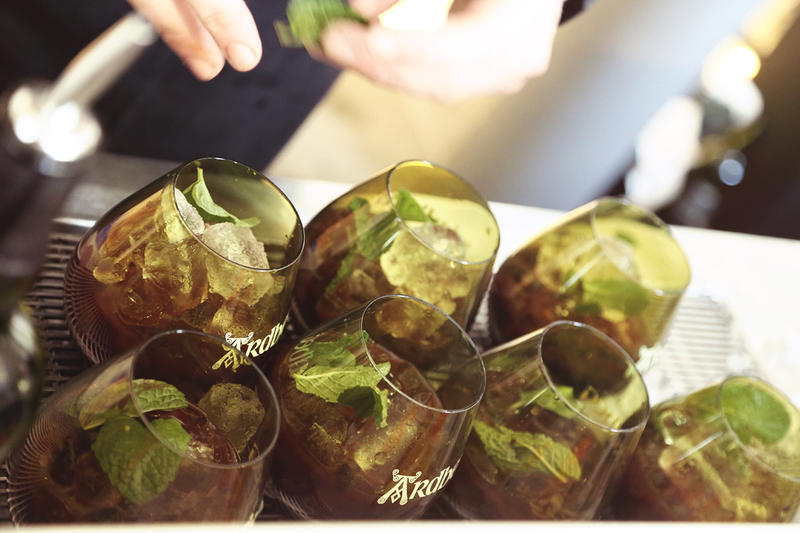 A touch of smoke and some salty spicy saline notes start to emerge. These hang around nicely with the residual sweetness – all of which seems to remain to the end of the medium length, warming finish. I really enjoyed this one. If I didn’t know, I would have guessed it to be slightly older than ten years and would also guess it to be a fair bit more mature than Ardbeg Day. As someone who enjoys a nice balance of sherry and peat, I found this one to be really quite pleasing. The vatting (as opposed to finishing) has really done wonders for it in my opinion. All of the aromas and flavours were much softer, rounder and balanced, especially when compared to 2012’s Ardbeg Day. 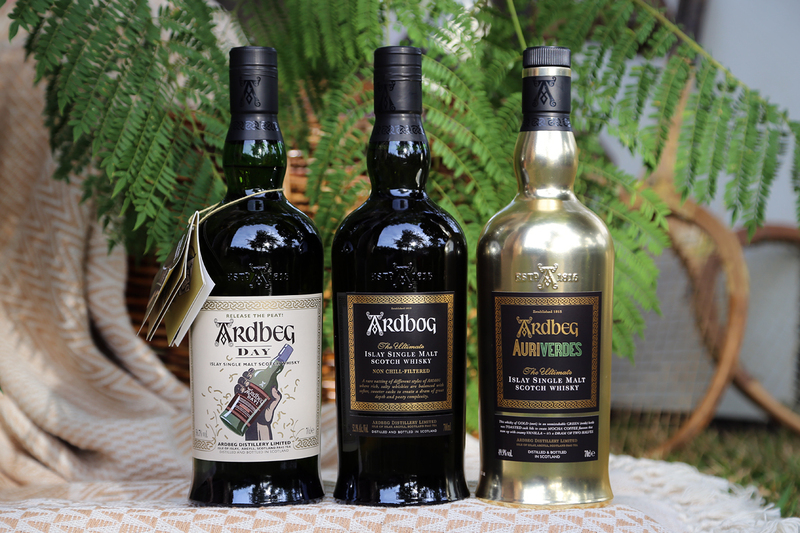 That being said though, I can also imagine Ardbog being a bit of a let down for some diehard Ardbeg fans, as some of those big hallmark Ardbeg flavours weren’t quite there. I appreciate distilleries playing around with the stock they’ve got and releasing exciting expressions, so that didn’t bother me in the slightest.